The famous words of the father of modern science, Sir Isaac Newton, were a fitting end to the Provost of Trinity College Dublin, Dr. Patrick Prendergast’s address to all who gathered in his home last Monday for a special Bridge21 celebration. 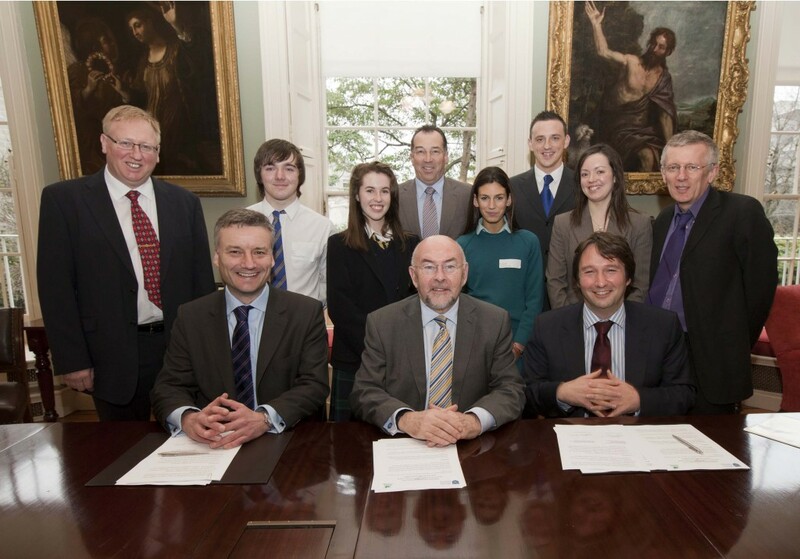 Minister for Education Ruairi Quinn was guest of honour to witness the signing of a Memorandum of Understanding in which both Trinity College and Suas Educational Development committed to continue their collaboration and support of Bridge21. There was a real sense of excitement, anticipation and history-in-the-making as three lucky students, together with the Bridge21 team, gathered in the library of no. 1 Grafton St. to watch Colman Farrell, CEO of Suas, and the Provost sign their names to the document. 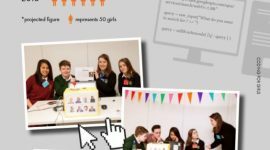 The excitement had been building from early morning, as 23 second level students from 5 schools came into Oriel House and worked tirelessly on projects for the showcase that afternoon. By the time the first invited guests started arriving shortly after 1pm, the portfolio of work completed by the students included a three-minute version of Macbeth, performed by a team of fifth years and a “live” news report from the 1916 Easter Rising, created by a team of first year girls. Suffice to say that the guests were very impressed by the standard of work and skills demonstrated by the students. Before long, however, lively conversations between guests and students had to be cut short as it was time to move across campus for the formal proceedings of the afternoon. Unsurprisingly, the theme of Minister Quinn’s address was the radical reform of our education system, particularly focussing on his vision for a new and alternative programme for Junior Cycle. The Minister highlighted that Irish students need “to be provided with more active learning opportunities that promote real understanding, creativity and innovation.” Claire Conneely spoke about Bridge21’s partnership with schools and the important role we have to play in the transformation of the Irish education system. Claire also talked to three students, Jack Barrett from Drimnagh Castle, Niamh Ellis from Colaiste Bride and Savana Assaf-Booth from Mount Anville, about their personal Bridge21 experience. We couldn’t have been more proud of the three of them as they spoke with confidence and enthusiasm about the Bridge21 model of learning and displayed a real understanding of the skills they have developed while working with us. Their overwhelming message was one of hope that “school could be more like this”. We share that hope and believe that the signing of the MoU was a big step in that direction! A huge word of thanks to all of our supporters, partners and friends who came along on Monday to partake in the celebrations and help us mark such an important occasion. Thanks also to everyone who supported and assisted us in the lead-up to the event – it seemed like an effortless performance on the day, but we know the amount of hard work that went on behind the scenes. Teamwork at its best…. go raibh míle maith agaibh go léir! For more information see the TCD Communications Office press release and the news item on the Suas website. 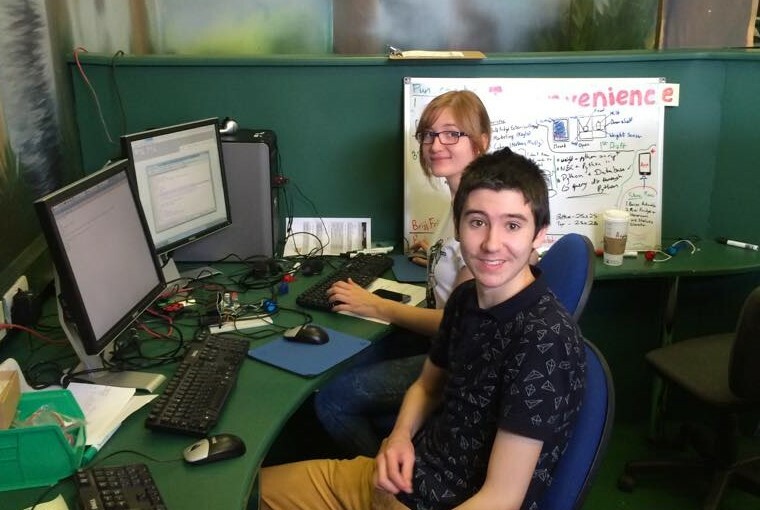 This entry was posted on Sunday, February 26th, 2012 at 3:58 pm. It is filed under Events and tagged with Minister, Suas, TCD. You can follow any responses to this entry through the RSS 2.0 feed.